Define categories for your products within the Broadleaf (PIM) system. Then, add product names, descriptions, marketing information, digital assets, prices, product options, shipping options, related media, URL information, promotions, and more. Create new catalogs, define offers, promotions, and even catalog-specific pricing parameters in just a matter of clicks via the Broadleaf admin. For multi-tenant enterprises, catalogs can be shared across multiple vendors, subsites, and commerce teams. 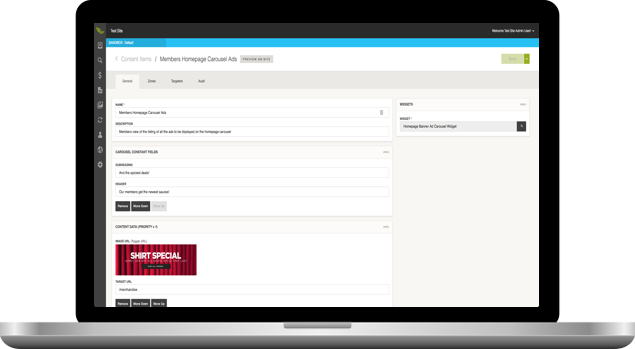 Discover streamlined catalog management and merchandising with Broadleaf. Sell t-shirts, shoes, or concert tickets? Create product options around any number of variables – including color, size, decimals, dates, titles, text, and more. Need a product with 3 different product options, say a red shoe in Men's size 10.5? No problem! You can even add a style like sneaker. One interface to manage it all. Picture and media descriptions, start and end date availability, tax and price list data, cross and up-sell products, category and featured attributes, SKU creation and management, shipping and fulfillment options, real-time inventory management and available quantity updates – all within your eCommerce site management system.